nd precisely because this recording sounds so marvellous, it tops the vinyl charts in the American specialist magazine The Absolute Sound. To be sure: no other 20th-century ballet music has ever created such a commotion as this ancient rite of spring: it began with a turmoil which developed into a full-scale brawl at the premiere performance in the concert hall, was sung hymns of praise and suffered devastating reviews by critics who tore the work apart, and led up to the musico-philosophical libel written in the Fifties by that self-acclaimed "chief enemy" of Stravinsky, W. A. Adorno. 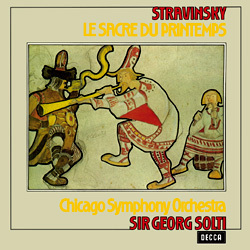 And Sir Georg Solti and his phenomenal orchestra certainly ensure that all this is brought over to the listener. The notes of the lyrical passages simply fly out of the loudspeakers with the lightness and airyness to which one is accustomed with DECCA recordings from this era. But one can still be astounded by this audiophile work of art: such a gentle, voluminous, lashing and pounding sound-storm is only normally heard live in the concert hall.